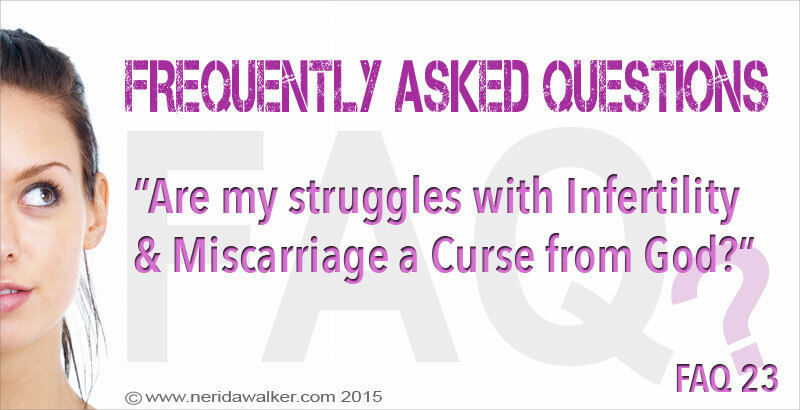 FAQ 22 – How do I overcome fear in Pregnancy? I need your help on how to overcome fear in pregnancy as I’m facing it on a daily basis. I pray and it eases only for a new fear to take its place. I also hear of women who have miscarried or faced other complications and I then fear the same thing happening to me. I don’t want to spend the rest of my pregnancy like this so please help me! I understand how you feel because there are so many different complications that can occur during pregnancy. Fear can be very real, especially when you are confronted with other peoples opinions or personal experiences. Needless to say, fear is not a good ingredient in pregnancy as it can be controlling and can rob you from enjoying this season in your life. You might find it comforting however, to know that everyone faces fear in different degrees. We all need to learn how to face and overcome fear at different stages of life. So know you are not alone. The Good News is that you don’t have to submit to or be controlled by fear any longerI God has equipped us in His Word so that you can face and overcome fear not only in your pregnancy but also in every other area. I have listed some things below that helped me and I pray they will continue to help you in your journey. This is not just for pregnancy but can be applied to any other area of life. 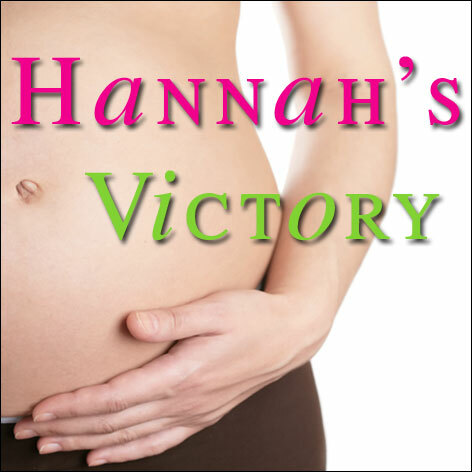 1) Remind yourself of what God has revealed to you for this pregnancy! Meditate upon any scriptures or anything else that God has spoken to you. If you feel you don’t have anything like this yet then its not too late. Spend time with Him and time in His Word until peace and revelation come. 2) NEVER look at other peoples personal experiences (whether good or bad)! This is your journey and your circumstances and they can both be unique. So just because someone else experienced something this does not mean that the same will happen to you. Therefore, don’t fall into the trap of presumption or fear. Instead look to Jesus and what He has already done for you! 3) Don’t ignore the Holy Spirit! if you feel you have a genuine concern that the Holy Spirit is revealing to you THEN know He will also reveal the solution! So let Him lead you in what to do etc. This won’t be a fear as such but rather a nagging concern or like a “check in your spirit” where you know something is not right. Follow His leading because while He will warn you of things to come He will also reveal the solution. So don’t let fear rule in this. Jesus will always lead you in peace so if you fall into fear then know that His peace is always freely available to you. If what you are feeling is just your own fears or concerns then…..
4) Resist Fear and it will flee from you! This is not about mind over matter but about replacing fear with faith. How you can achieve this is by reminding yourself of what God says instead of what your fears are saying. This can be a daily onslaught at first – especially if you take your focus off of what God has spoken to you and you look to the world or to other peoples experiences instead. Simply place your focus back upon Him and continue to renew your mind. Ttake one day at a time and know that you have not failed if you are facing fear. Fear is not bad in and of itself but it is what we do with that fear that determines our frame of mind or outlook. 5) Remember that you are not alone! The very Spirit of God dwells in you and is with you wherever you go! This means that you can tap into His wisdom, understanding, revelation, counsel (solution) and POWER whenever you need it! He is ALWAYS with you and He is ALWAYS looking to show Himself strong to you! So get to know His presence and His leading so that whenever you are faced with fear you can reject it and draw from His peace, comfort and wisdom instead! 6) Don’t look to the root but continue to focus upon the solution! Jesus has paid the price and won the victory for you through the finished work of the Cross! So no matter what sickness, disease or complication you might face or be fearful of in your pregnanacy know that Jesus has already done all the hard work for you. So dont strive towards your breakthrough or labour in your own strength but instead learn how to rest in who Jesus is and upon the fullness of what He has already freely provided for you. 7) Know that God does not show favouritism and He cannot withhold what He has already done through His son! This means that anyone who believes in and rests in Jesus can experience the same outcome! When you learn how to recognise and follow the Holy Spirit’s leading your life will never be the same again. Don’t be too hard by placing a time limit or unrealistic expectations upon yourself. Simply start afresh by taking one day at a time. It is my prayer that you will overcome all your fears and enjoy every stage of your pregnancy. FAQ 21 – Why is Healing not Automatic? 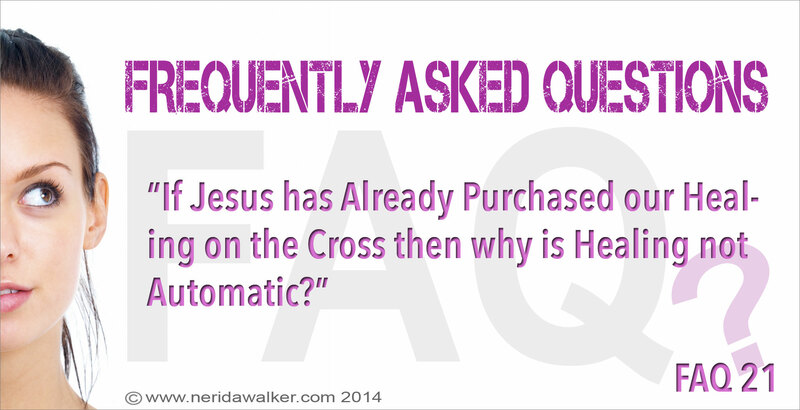 In this message Nerida answers this FAQ and also covers how you can partake in Jesus finished work to see it outworking in your life. Often when things go wrong or don’t go as planned we may comfort ourselves with something along the lines of “Its’s ok because God is in control”. I don’t know about you but to me the thought of God being in control of the suffering or even passively sitting back & allowing someone to suffer with evil has never comforted me. God is NOT in control of all the bad things that happen in our lives! This means that God is NOT in control of sickness or diseases such as nfertility, miscarriage or other pregnancy complications! He is also not in control of the condition of your reproductive organs or even in control of the “timing” of the conception of your children. While God is NOT in control of everything that happens within this fallen world – ALWAYS REMEMBER that HE IS IN CONTROL OF THE SOLUTION! And God has already provided this through the finished work of the Cross! You will understand this easier when you can first understand God’s Plan of redemption for Mankind. I have outlined this within my blog post here. Is God in Control? is also available as an Audio Message Download CLICK HERE for more information.